Following on from our ‘5 Basic Tips on the use of The Mirror’ earlier in the year, I thought I’d embellish on the theme slightly over the coming editions. We all know that sometimes there is a room in our house, or our office, that just doesn’t seem to feel as big as it actually is, or as light as we want it to, so – having just bought a new house myself – I thought that using mirrors to maximise light and space would be a good place to start, and I will definitely be using a few of these ideas at mine. Large mirrors behind furniture in tight spaces; bring extra size and depth to your space. And is a particularly effective technique when used behind sideboards, making them look as if they were made for the space rather than squeezed in. This trick will also allow you the luxury of extra light in the hallway or front room and gives the owner the chance to make a final (or first, depending whether you are coming or going) ‘once over’ of both themselves and the space before they leave the house. 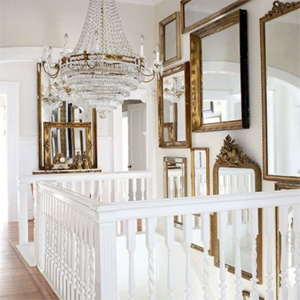 If you’re into it, it is also considered excellent for your house or office’s Feng Shui to have a mirror in the entryway. Furthermore it’s a fantastic technique to maximise light and space in your bathroom. By placing a mirror behind a light source; you can turn a small light into a bright one, without losing the warmth of the small lamp. This technique will truly maximise the area the light covers and also give you an effect entirely unique to you, no-one else will have quite the same furniture, space or bespoke mirror that you do. Mirror, mirror … in the garden? Who would have thought that one of the favourite tools of landscape gardeners would be a mirror? If you want to do something different with your garden and turn it into a light and spacious outdoor paradise, whether your garden is large or small, you can add an extra dimension to it using mirrors. The number of effects you can create with mirrors in your garden varies almost as much as peoples’ gardens do. 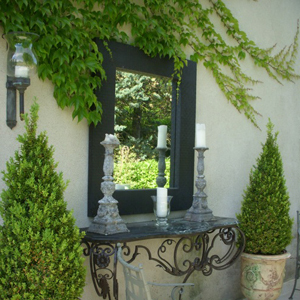 Whether you want to use small mirrors to create window-like portals or you want to use larger ones to make your garden look double its size, a well-placed mirror can do the trick. When placed in your garden, mirrors will create the best effects when there are a lot of plants growing around them, this helps them to blend into their surroundings and stops the edges showing as obviously. Also remember to be conscious of what the mirror is reflecting, if it is just the back of your house it might counteract the illusion you’re trying to create. Use slight angles so that the mirror doesn’t reflect the house or you as you walk up to it. You could try a number of methods; maybe attach a gate to a large mirror with a path leading up to it – this will make it look like the path continues through the mirror resulting in your garden seeming much bigger. Half submerge one in your hedge, giving the impression you have a secret garden on the other side. You can attach mirrors to garden walls to give the effect of being able to look through it at another garden. If you have a shed you want to hide, maybe attach a few mirrors to it and allow some ivy (or any plant you like) to start to grow around it. The possibilities are endless. Try taking a mirror outside and having a bit of a play to see where it looks best in your garden and to decide what effect you want to achieve before you go out and buy a new mirror then decide it doesn’t look right. When to back or not to back, that is the question. Well, not “The” question, but one we get asked an awful lot, so here I’ve simplified the “what’s what” of mirror backing. To start with, there’s basically three main types of safety/backing films. Standard Laminated Safety Backing Film, woven safety backing and foil backing. All have benefits, some more than others and each with its own price tag of course. The film can also be used in framed mirrors, where safety is a concern, such as public access areas, but primarily for the same reasoning. But sadly for the film, being silicone based, it doesn’t stick with adhesive very well, if at all. Moving on to foil backing. This backing was originally used as barrier between wall and mirror backing, with the need to stop any potential moisture or chemical seep from the wall into the mirror. On cheaper quality and old style manufactured mirror, this was deemed essential to stop such moisture and chemical corroding and eating into the mirrored backing, often leaving tell-tale black marks or cloudy mirrors. Again for the technical buffs, the foil complies with the following regulations BS476 PART 6 & 7 & MEETS CLASS 1 & CLASS 0 FIRE REGULATIONS. And finally and undoubtedly saving the best until last, but with a price tag to match, is the woven safety backing. 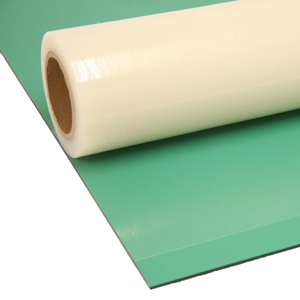 This combines both the strength of the laminated film with the barrier properties of the foil. Meeting all these safety standards it certainly ticks all the boxes. Over my years here at Mirrorworld one of the questions I've been ask most often is:- "How do I hang my new mirror?" The answer, which doesn't always go down well initially is, "It depends." When hanging your new mirror, quite a few factors have to be taken into consideration. I've tried to put together just a short compilation of the most common scenarios and factors to be considered and those which will cover most everyday instances you may encounter. However, as we all know, not all homes and houses are built the same and you may find your circumstances throw an extra spanner into the works so to speak, so please treat this article as only a guide. The first task when you've decided where you'd like to place you mirror is to try and determine what kind of wall you're going to be mounting your mirror onto. It may not even be a wall, it might be a door, or framework or even suspended. Making this first decision is not quite as simple a choice as it first looks. Next. What is this surface is made up from? Brick, plaster, breeze block, plasterboard, wood. All common materials and all fairly recognisable. Tapping the wall at this stage can give a good indication here. A solid tap, would normally indicate a brick structured wall, whilst a softer sounding solid tap would indicate a wooden solid wall or studding. Take care with this one as it's easy to tap on a joist or cross member of a studded partition and think it's solid, but tapping a little further along and getting a hollow sound will be a giveaway of a hollow stud wall. Finding out what wall surface we're dealing with is only normally necessary when we're about to drill into it and choosing the right drill bit here is also essential. For wood and panelling a high speed twist bit is suitable, but however, for brick and plaster a masonry bit is required and a specialist glass and tile bit for tiled surfaces. But some mirrors however are put up without the drill even coming out of the tool box. In these circumstances it important to recognise the type of surface you're dealing with too. Such specialist adhesives can be used directly onto flat, dry, plastered or painted walls or even direct onto tiled surfaces, but it's not recommended to mount onto papered walls or where the wall have been freshly plastered and painted, as the moisture in the paint and or plaster will inhibit the adhesive setting properly, with the probability of an unsafe installation. In Part Two of "Ways To Hang A Mirror", I'll talk about some of the different fastenings available for the differing wall surfaces and which to use and not to use in the different circumstance. Remember, when hanging your mirror, being prepared and know what you're dealing with before starting the installation is half the battle..
Screwing A Bathroom Mirror To The Wall. Over the years lots of people have asked "How do we fit our mirror the wall using screws?" Well. It really is easy, especially when approached in the right way, with the right tools. Here's a few tips that'll help to put your mirror up safely and quickly. To start with, clear the area your working in of all unnecessary clutter, you don't want to be falling over anything with a mirror in your hands! Gather the tools you need to complete the whole job. Pencil, tape measure, drill (with the correct bit for your type of wall), the correct wall fastening for your wall (wall plugs differ for different wall types) screwdriver (NOT an electric screw driver. This is the most common way people break their mirror before they've even had chance to admire themselves), a spirit level if available. Believe it or not, most smart phones can download an app for this... and last but not least an extra pair of hands is always useful. Be clear where you want to put the mirror before you start. Measure the mirror and the wall. Measure twice and fit once is always a great saying, I can't state enough. Start by marking where the centre of the mirror wants to be, then measure equal distance either side of this line where the two uppermost holes want to be located, ensuring these are level with each other and the distance between the hole marks are equal to the distance between the centres of the holes of the mirror. Drill and plug these two holes in your wall. Next is the trickiest bit; place the rubber grommets into the top two holes of the mirror, from the back of the mirror, then offer the mirror up to the wall so the holes of the mirror correspond with the new holes and plugs in the wall. Next, VERY CAREFULLY, put the screws through the holes and grommets in the mirror and into the plugs in the wall, tighten screws ONLY enough to hold the mirror firm, DO NOT over tighten, you will crack the mirror. With both screws in place you should now be able to release the mirror and it will hang on the two screws. With the mirror on the wall, mark the other two holes with a pencil through the holes in the mirror. Now, Carefully remove the mirror from the wall and place to one side. Drill and plug the two newly marked hole locations. Repeat the earlier step, offer the mirror up to wall and align with all four holes. fitting the top screws first, but DO NOT tighten before fitting the bottom two screws. 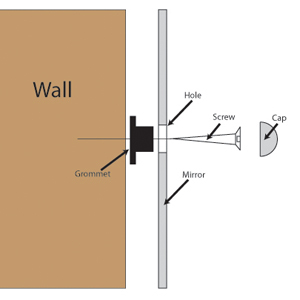 TIP: If you have any curvature in the wall, even one you can't see and you tighten the screws too soon, you may break your mirror. With all 4 screws in place, tighten each screw gently and in turn, a little at a time, until the mirror is held firmly on the wall, there is no need to over tighten, just enough to hold the mirror to the wall.